One of the hardest parts of moving to a new city/state is learning about local activities. Are there movies in the park here? What are the best breweries to go to on the weekends? What races can I run? The important things in life. Luckily, friend of JKR Michelle Billick has lived in Charlotte for a handful of years now and is going strong on her racing game. She mentioned that she was running the Hit the Brixx 10K and suggested that Scott and I should run it. 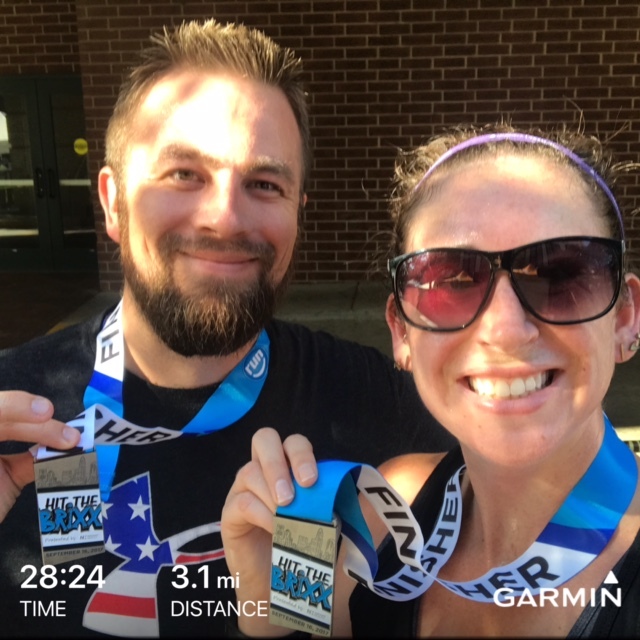 I hadn’t run more than 3 miles since the Charlotte Spartan Sprint, I was happy to find out there was also a 5K option. We quickly registered! I had been looking for a reason to get back into running. I’m finally starting to really feel good about my running ability, with almost no ankle pain in months. I started doing more runs during the week to prepare. Scott mapped out the course and thought it was mostly flat with no crazy hills. We learned on race day that he was wrong. There is an option to run both the 10K (7:45am start time) and the 5K (9am start time), which a lot of people did. I’m not going to lie, it made me long for the days when I could run that far! The start and finish line were a quick 5 minute walk from each other, allowing us to cheer Michelle in before heading to begin our race. The race started right on time, but there was no fanfare. No national anthem, no count down. Just GO! The race itself was very pleasant. The crowd quickly dissipated and there was plenty of room to run. The first half of the race was downhill, which didn’t bode well for the second half of the race. The last mile and a half (or so) were straight up hill. I had a great race and felt very comfortable until I got 85% up that final hill and had to walk. It lasted FOREVER. I finally crossed the finish line and was VERY happy with my performance. 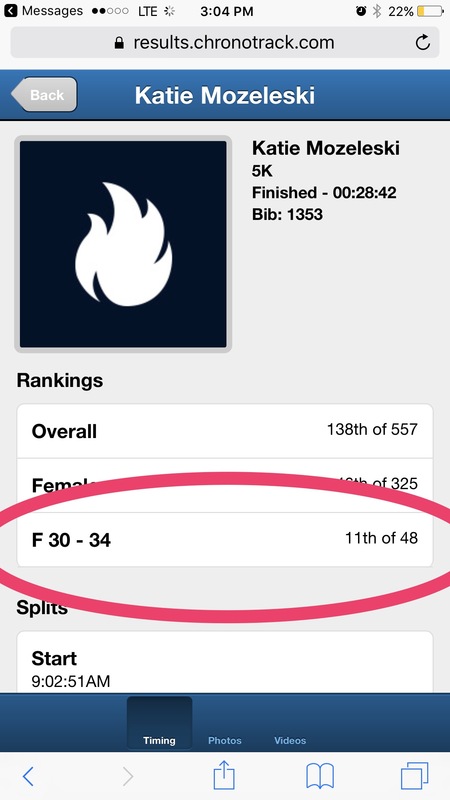 I had only run a handful of times so I was certain this would be a bad race for me. I ended up placing 11th in my age group and Scott placed 12th! Race Price: 5 It was only $30! Organization: 4 There weren’t many volunteers around making sure you knew where you were going. With people doing both races, there were runners everywhere. I think that could have been handled better. Level of Communication: 4 I only received 2-3 emails before the race. Race Course: 3 A little boring since it’s mostly an out-and-back. Swag: 3 Since Brixx was a sponsor we had free pizza, pasta and beer! Medal: 5 Same medal for both races, but there’s a MEDAL. FOR A 5K! Best part, if you all 6 races in the Run for Your Life Series, it forms one mega medal. Spectator Support: 3 You ran around a few soccer fields, so most support came from soccer parents. I took advantage of this by high-fiving a 5 year old. That, understandably, was the highlight of my race. I plan on doing the 10K next year and Scott and I have signed up for their next race: Rocktoberfest 5 miler. CAN’T. WAIT.